It's no longer the stuff of science fiction. We are being promised the next generation of cars will talk and network with others on the road, looking around corners, and even through lorries. 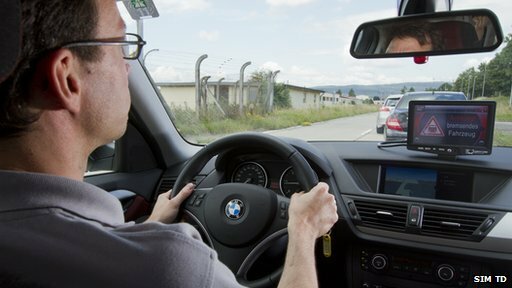 Vehicles equipped with "car-to-x" technology, should warn of hazards far beyond the vision of the driver including traffic jams further along a motorway or a vehicle making an emergency stop up ahead. The organisation behind the technology is Frankfurt-based Safe Intelligent Mobility Testfield (Sim TD), a consortium of vehicle manufacturers with factories in Germany. Mercedes Benz-maker Daimler is leading the project and BMW, Audi, Volkswagen, Ford and Opel are also involved. They have already held the world's largest field test of car-to-car communication around Sim TD's home city: 500 drivers signed up to test the tech and clocked up a total of 1.7 million km (1.1 million miles). Sim TD says you can expect to see the first talking cars on the road in 2015. Vibrating steering wheel There are few conspicuous new features. In fact, from the outside, you can't even tell you're looking at a talking car. Inside, the biggest clue is an extra monitor mounted on the dashboard. Integrated electronics built into the car send sounds and images onto the device to flag up information or warnings to the driver. If a situation gets more urgent, an alarm wails and the screen flashes red. Audi is testing other mechanisms, including a vibrating steering wheel and force feedback pedals - a pedal which pushes back or vibrates when the driver tries to accelerate. "That will get the driver's attention," says Robert Manz, an Audi developer. "Most of this information is only important to the driver. You don't want to alarm all the passengers." It's not just about intelligent cars. Interactive traffic signs and traffic lights equipped with sensors will also talk to each other and swap information with cars in the area. Intelligent traffic lights can tell a car well in advance what speed will get him through the next green traffic light. Or if you're waiting at a red light, your car can tell you how long the wait will be. It could even scout out a free parking place for you. "This system has huge benefit potential," says the project leader, Dr Christian Weiss. "If we succeed in making traffic more fluid, we improve mobility. "That also has an impact on the environment. If you have smoother traffic, you use less fuel." Saving lives Germany could save an estimated 11.4bn euros ($15bn, £9.6bn) in congestion and accident-related costs, according to Dr Weiss. "We'll see a big improvement in safety if we have systems like this on the road," adds Felix Deissinger, a BMW motorbike expert. Nearly 3.500 people die on Germany's road per year. Cars crashing into unseen motorcyclists are the most common type of accident. "Vehicle-to-vehicle communication means the car gets the info that a motorcycle will approach, long before he can see the motorcyclist," explains Mr Deissinger. 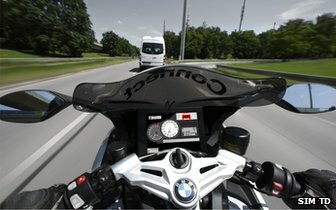 To further minimise the risk of collision BMW is developing what it calls "conspicuity enhancement" - a feature that makes bright lights flash on a motorcycle if it detects a crash is still likely despite other warnings. 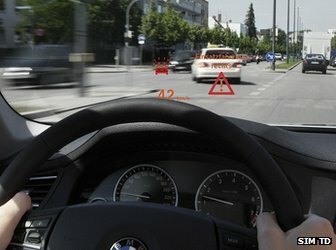 BMW has also devised a head-up display to project information onto its cars' screens. In vehicles equipped with the car-to-x technology, it can display high-contrast warnings about strong winds, icy roads or motorway concrete buckling in the heat. The firm says using a head-up display halves the amount of time it takes for drivers to switch their attention from the road to the read-out information. Multiple personalities Car-to-x relies on a mixture of wi-fi and 3G mobile connections. Berlin's Fraunhofer Focus Institute has helped ensure they all work together. The data is not stored anywhere and the test drivers should not be concerned about implications for their privacy, according to the institute's Ilja Radusch. "We use pseudonyms," he says. "Instead of one identity, each car has a thousand identities, with them changing each second. So no one can track you." According to Sim TD, only 5% of cars on an area's roads need to use its system for there to be a positive impact on traffic and safety. In Germany, that would mean two million cars equipped with the tech. Achieving that goal may depend on the cost of installing it. A price tag has yet to be announced. Meanwhile, Sim TD says it plans to fit the first motorway with compatible electronics by 2015. It says the tech will let drivers on the Vienna-to-Rotterdam route know about upcoming traffic jams. "Car-to-x will play a role in every market in the future," promises project leader, Dr Weiss, adding that tests are already underway in the US, and talks have begun with officials in Japan and China.